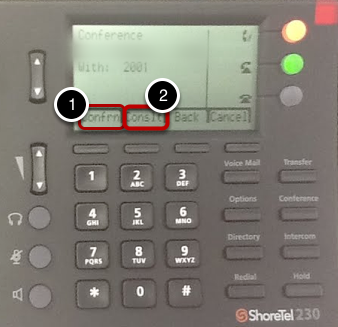 Follow these steps to make a conference call into a call to which you are already connected using your ShoreTel phone. You can conference up to six parties into a single call. 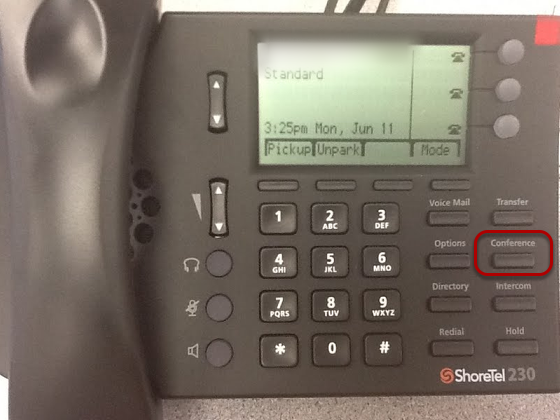 This will place the original caller on hold while you connect the new recipient. 2. Dial the number and press the Conslt soft key to speak with the recipient before ringing him or her into the conference call. press the "Cancel" soft key to return to the original two-party call. After a conference is established, you can use the "Show" soft key to display all conference parties. If you wish to disconnect a party, scroll to the party's entry and press the "Drop" soft key.